Our family are big pasta eaters and love Italian food! I serve pasta at least once a week. 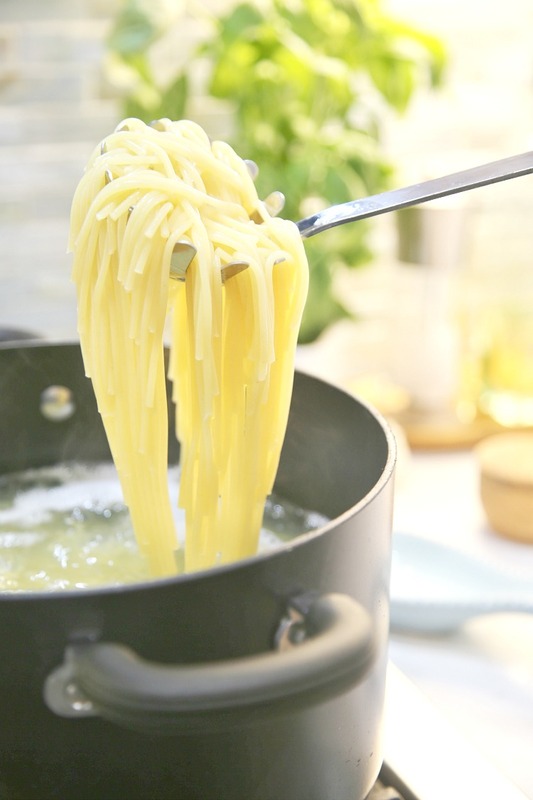 What I appreciate about pasta dishes is that they are so versatile, can be served hot or cold, and are perfect to prepare quickly on a busy school night. Second to my love for pasta is shrimp, especially if it’s grilled! Today I want to show you a simple and flavor filled 20 minute meal! 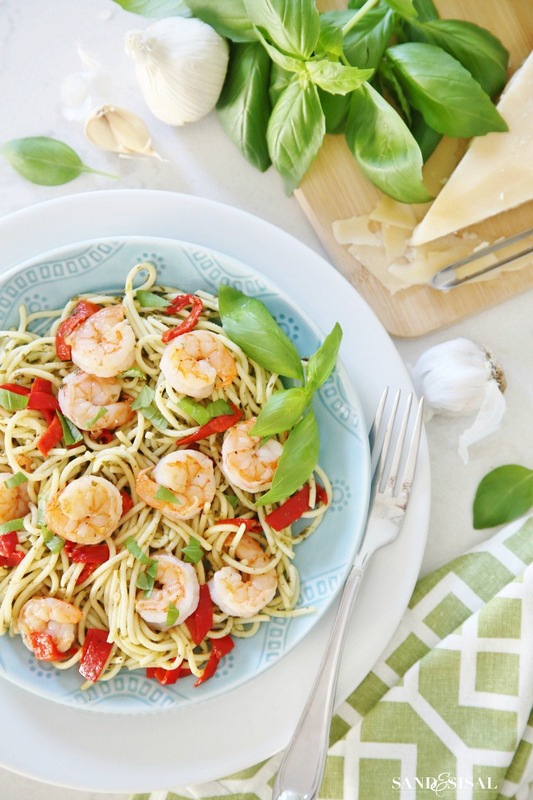 We’re making Pesto Pasta with Grilled Shrimp and Roasted Red Peppers with help from @BarillaUS. 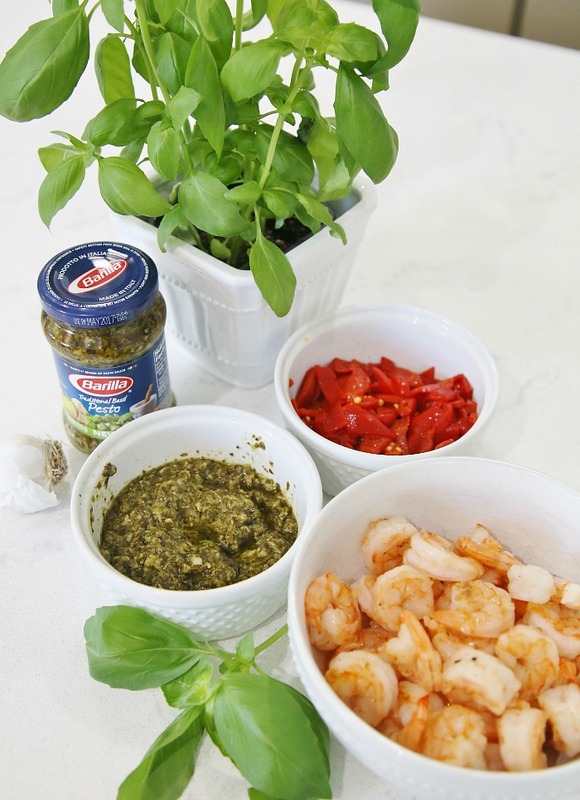 The beauty of #BarillaPesto is that you can add as little or as much as you like. I love the rich taste of a lot of pesto on my pasta but my kids prefer a lighter taste. My recipe has just the right amount that everyone will enjoy. 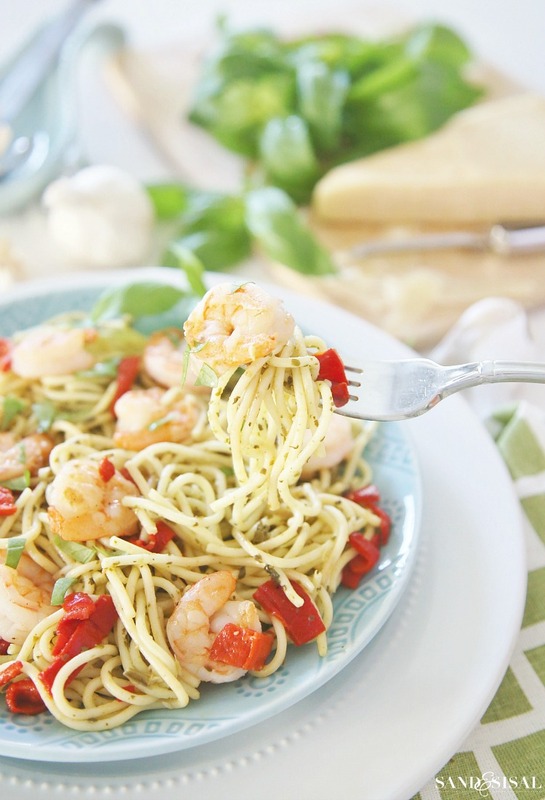 Cook up the pasta to “al dente” and stir in the pesto, chopped roasted red peppers and grilled shrimp. Just 3 easy ingredients will make this recipe a new family favorite. Watch my 1-minute video to see just how I made Pesto Pasta with Shrimp and Roasted Red Peppers! Print off this recipe below for your recipe box! Place cleaned shrimp in a bowl and drizzle with the olive oil, garlic and lemon juice. Stir until coated and set aside. Prepare Barilla Organic Pasta according to box directions. Drain and return to pot. Grill shrimp on high heat until pink and opaque. Approximately 1-2 minutes per side, depending on size of the shrimp. Add ½ cup Barilla Traditional Basil Pesto to hot pasta. Stir to coat well. Stir in roasted red peppers and shrimp. 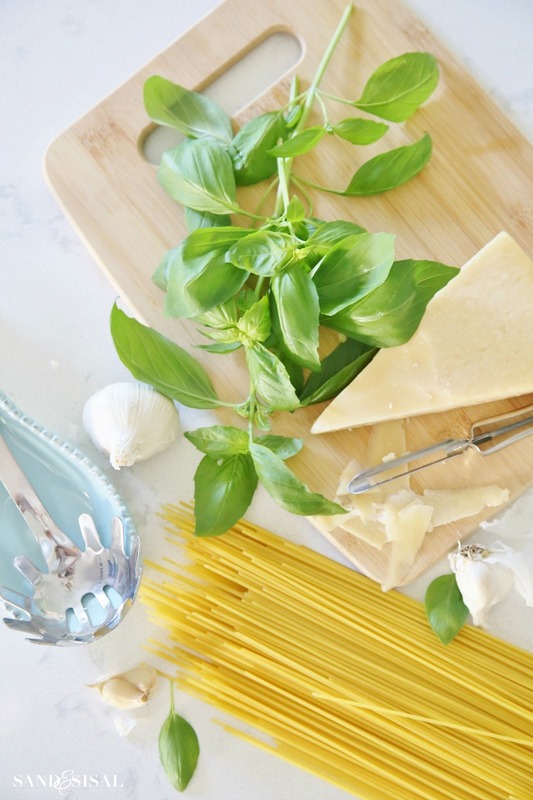 Garnish with chopped fresh basil and parmesan and serve! Here is another way you can use these ingredients. 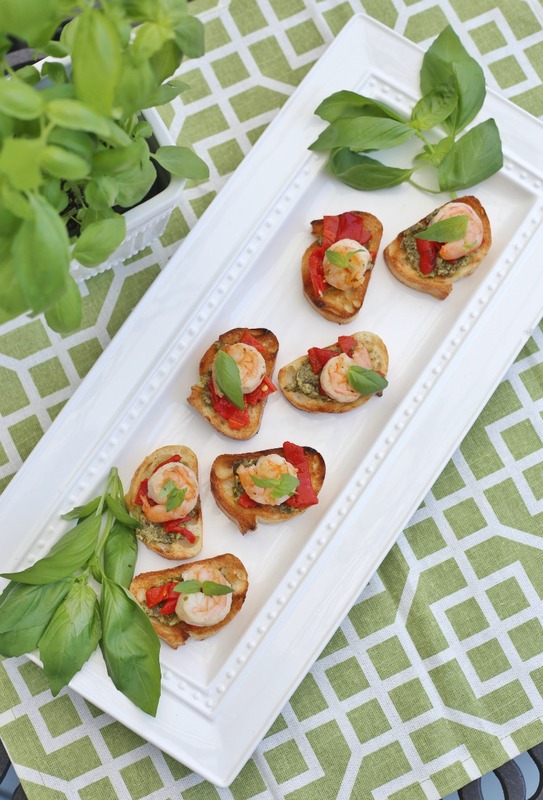 Try Grilled Shrimp Crostini with Roasted Red Pepper and Pesto for a simple appetizer that everyone will devour! Prepare the shrimp as directed in the recipe above. Slice a baguette into thin slices. Brush on extra virgin olive oil onto each side of the baguette slices. Broil or grill each side until toasted. Top with a 1/2 teaspoon of Barilla Pesto Sauce, a few roasted red pepper slices and a grilled shrimp. Garnish with fresh basil. Serve at room temperature. Enjoy!